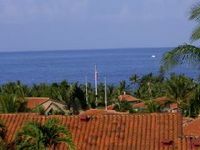 The Big Island Country Club is situated above Kona, on the lower slopes of the 14,000 feet Mauna Kea Mountain. At an elevated level of more than 2,000 feet, the course provides excellent views of the mountain above and the Hawaiian coastline beneath. This is one of the Big Island’s most distinctive golf courses where the air is cool and the winds relatively light. Such a beautiful setting is the perfect destination and sure to inspire those who play the course. An 18-hole, par-72 course, the Big Island Country Club golf course was designed by renowned golf course architect Perry Dye and opened in 1997. The greens are moderate in size and speed, and the fairways are wide and beautifully landscaped. Indeed, with its wonderful mature trees and superb water features, including waterfalls, the course has become something of a bird sanctuary. The gently rolling fairways are laid with Bermuda grass, the undulating greens with Brent grass, and water comes into play at nine holes. With all the attributes generally expected of a world-class course, an array of interesting features, panoramic scenery, and an excellent location, the course is both challenging and enjoyable. The fact there is five sets of tee boxes at each hole make the course sufficiently challenging for seasoned players yet also suitable for novices. The signature hole at the Big Island Country Club is the 17th, a par-3 where water comes most prominently into play. Superb views, moderate trade winds, refreshingly cool air, and well-maintained surfaces are all trademarks of this 7,034-yard course. 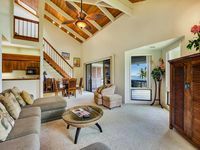 The amenities at the Big Island Country Club are excellent and entirely befitting a golf club of its caliber. In addition to cart and club rental services, the practice facility includes a driving range. The Golf Academy offers lessons to players of all ages and abilities, and helps people to improve their game, become more competitive, or get started from scratch. The pro shop at the club offers a wide range of merchandise, food, beverages, gift cards, and more. Refreshments can be obtained from the club’s lounge and snack bar. 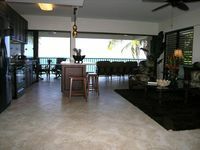 Kona Oceanview Penthouse in Kailua Village - Best Kona Location/View!